Interior view of Denbigh Hall. Five students stand or sit by the staircase. One student sits on the staircase (on the right side of the image) reading a letter. Two students stand by the staircase. Another student looks like she is opening a mail. She stands near the mailboxes on the right side of the image. Another students stands next to her reaching down where there are packages lying on the ground. A duplicate of this image is also available. 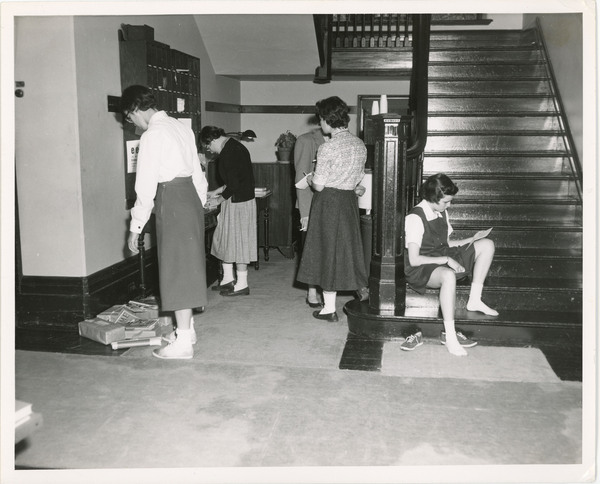 “Students checking mail, Denbigh Hall,” The Albert M. Greenfield Digital Center for the History of Women's Education, accessed April 24, 2019, http://greenfield.brynmawr.edu/items/show/2697.